Heather Casparro graduated RCBC in May with an associate degree in Human Services and a perfect 4.0 GPA. Rowan College at Burlington County Board of Trustees Solicitor William Burns swears in Heather Casparro as the new RCBC Alumni Trustee at the board’s meeting on Aug. 21. Rowan College at Burlington County officials have announced that Heather Casparro, who graduated RCBC in May with an associate degree in human services and a perfect 4.0 GPA, was elected to serve as the 2018–2019 Alumni Trustee. Casparro, of Westampton, was a stay at home mom to two boys, Aiden and Dane, before enrolling at RCBC in 2015. According to officials, the 39-year-old, who grew up without much guidance, knew she had more work ahead of her than most students. She had an undiagnosed learning disability and possessed few literacy skills, which officials said made it very difficult to read. However, officials say her perseverance paid off in the end. She earned a scholarship from the National Organization for Human Services, beating a nationwide pool of students that included students working on their master’s degree, and received the RCBC Human Services Academic Award and the RCBC President’s Award scholarship. Each year, a member of the college’s graduating class is elected to serve a one-year term as a non-voting member of the college’s Board of Trustees to represent the class. 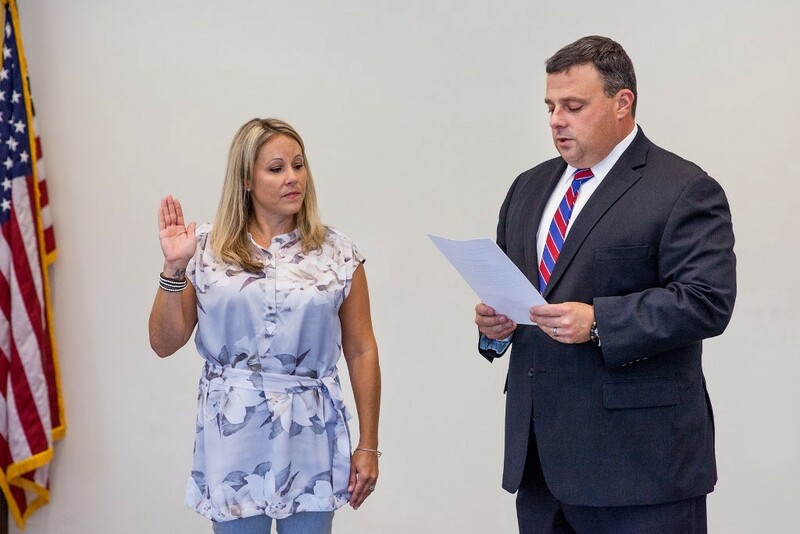 Casparro took the official oath of office at the Board of Trustees meeting on Aug. 21. Officials said Casparro was inspired to give back by a volunteer for the Children’s Hospital of Philadelphia, who supported her in her darkest moments as her son, who was preschool age, was fighting a life and death battle with pneumonia. Today, Casparro is a child advocate volunteer for CASA (Court Appointed Special Advocate). This fall, she plans to intern with the Burlington County Coalition for Healthy Communities as she pursues a bachelor’s in behavioral science from Wilmington University. She hopes to obtain a master’s in social work and serve as a child advocate in a courtroom, or wherever she can make the most difference.